Hello all, hope you are well! Now before we get down to business, in the last post I hinted at some bits and pieces I’ve been getting involved in lately and I thought given that this post is a Thomson one it’d be appropriate to drop in some of the things I’ve been up to. First, the Architect IPA! 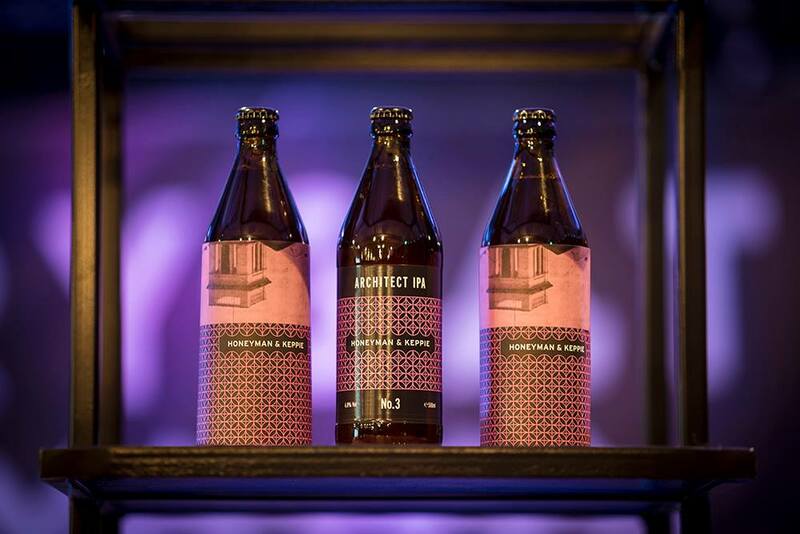 As part of the Festival of Architecture 2016 the Glasgow Institute of Architects, in collaboration with Drygate and Graphical House, have produced a festival beer that will be available with 6 limited edition label and wrap sets featuring prominent Glasgow architects (Charles Rennie Mackintosh, Alexander Thomson, Basil Spence, Robert Adam, Gillespie Kidd & Coia and Honeyman & Keppie). My main contribution was in writing the biographies and finding the archive images that feature on the bottle wraps so keep an eye out for them! 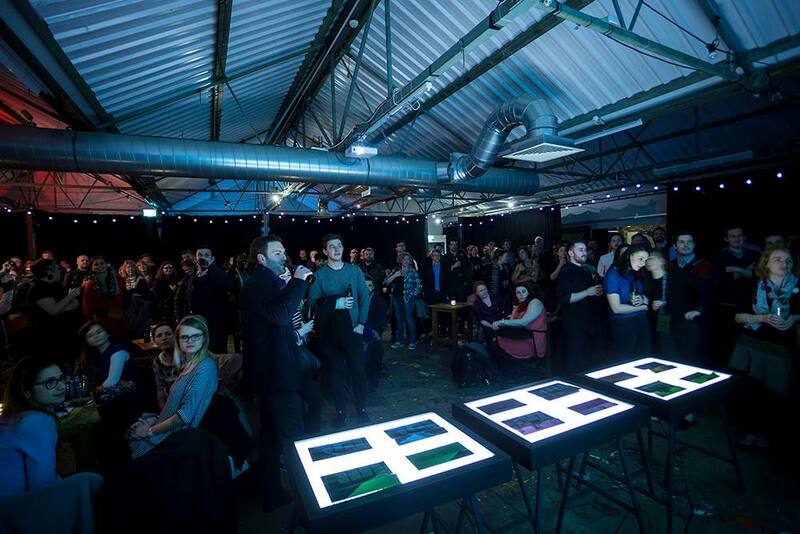 The launch night went really well with around 200 people coming along, and the first batch of sets selling out within 30mins! Future events where they’ll be on sale will be added to the FOA2016 website throughout the year. Secondly, I’ve been elected to the board of The Alexander Thomson Society! The society is a great organisation that organises lectures, tours, walks and various other activities each year, we are looking to expand our membership so if you’ve got an interest in finding out more visit the website here and follow our fledgling twitter account here. 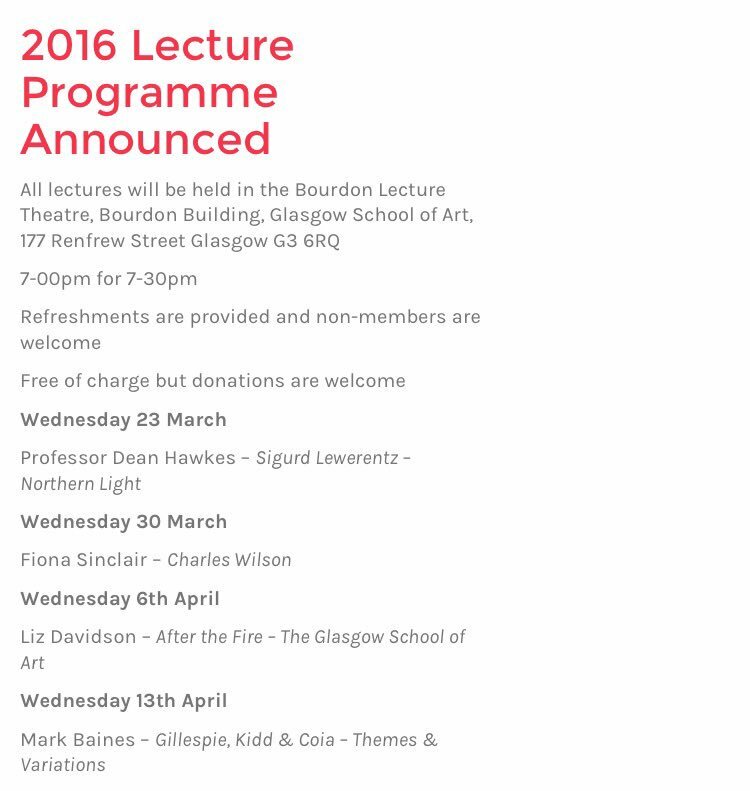 The society’s annual lecture series began on Wednesday and takes place over 4 consecutive weeks, its completely free to attend, no ticket required and you’ll get a cheeky glass of wine thrown in alongside some excellent speakers, who could argue with such a prospect! So now that the promo is taken care of we can dive right in to todays building! 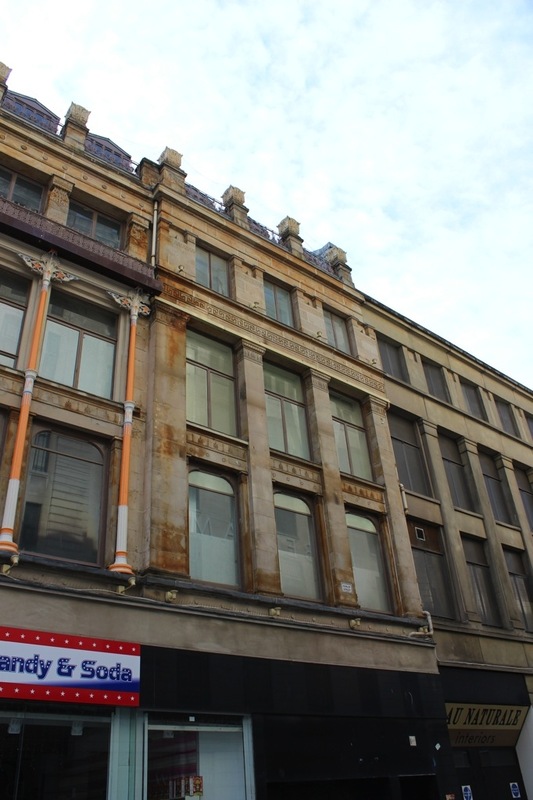 63 Argyle Street as designed by the brilliant and aforementioned Alexander ‘Greek’ Thomson. First conceived in 1863 and completed in 1868 this shop and warehouse building is more commonly known as the Buck’s Head Building, the two reasons for this being that the site was formerly home to the Buck’s Head Hotel, and also that the current building has a big statue of a deer on the top of it! 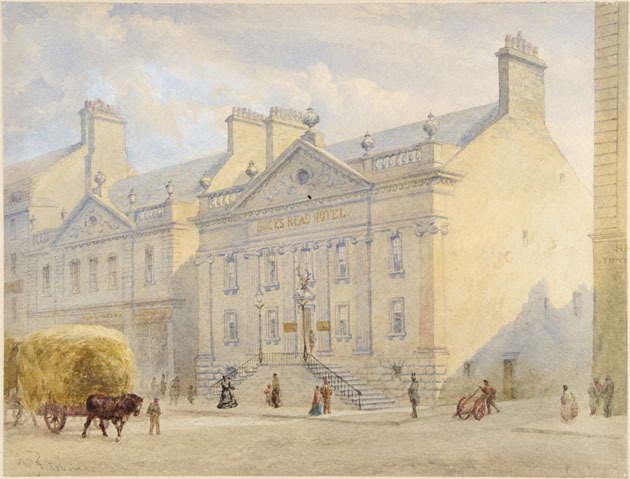 The original Buck’s Head was built in 1751 as a mansion for Provost Murdoch before being converted to an inn in 1790. It’s famous residents included Sir Walter Scott, Thomas Telford and the poet laureate, Robert Southey, who gave it the 1800’s equivalent of a 1-star TripAdvisor review: “The inns in large cities are generally detestable, and this does not appear to form an exception from the common rule.” The hotel closed in 1860 paving the way for Thomson’s building on the site. Immediately the question arises as to why Thomson didn’t continue the same facade pattern into the Dunlop Street extension. 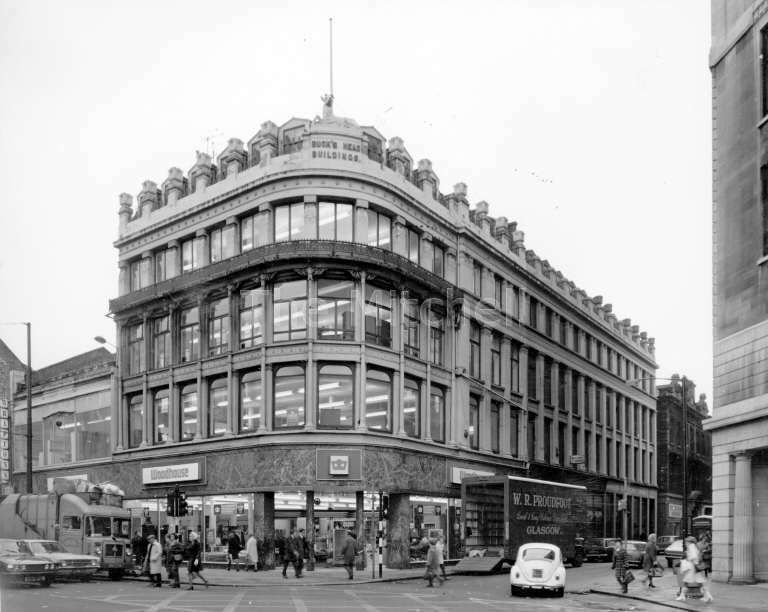 McFadzean speculates on Thomson’s logic for not continuing the already established facade pattern in his 1979 book, The Life and Work of Alexander Thomson, that “perhaps he wanted to express the differing functions of the buildings by differing elevational treatments.” However, given that the shop units continued underneath and that the upper floors continued to serve as warehouses this seems less likely. More likely is Stamp’s unearthing of correspondence which shows that the original 1963 building was delayed due to concerns over the structure, it may be instead that Thomson reverted to a more traditional masonry construction to prevent any delays on the second phase of the project. 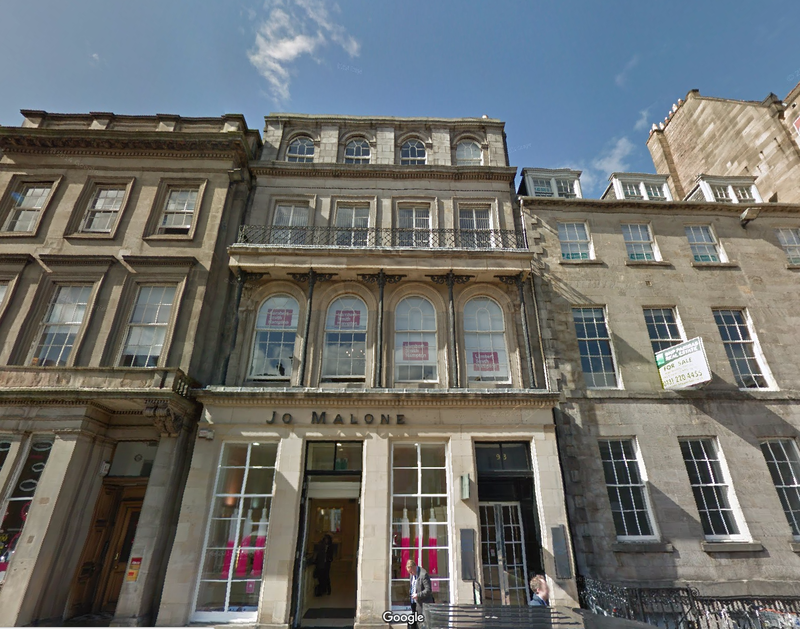 So now lets consider the building from the ground up, beginning with the 1863 Argyle St section. At ground floor level the original shopfronts have long been lost and have changed regularly over the years. The only original elements understood to be remaining within the shop units themselves are the cast iron columns that support the facade above. Externally the buildings most distinctive feature are its primarily decorative cast iron columns that span the first and second floor to carry the projecting stone cornice and cast iron balcony at third floor level. These are simply decorated at first floor until an intermediate capital decorated with anthemion patterns which appears Egyptian in influence marks the cill level of the second floor. The column tapers above to meet the second floor cornice where brackets explode from each side in an Assyrian style where scrolls of leaves wrap themselves around flowers, it is completed by a final flower reaching out from the top which it is rather frustratingly obscured by the strange skirt that has been added to the balcony above. Gomme and Walker suggest in Architecture of Glasgow that the cast iron columns supporting a balcony may have been influenced by Thomas Hamilton’s 93 George Street in Edinburgh, which is not out with the realms of possibility given the admiration Thomson showed for Hamilton in calling his Royal High School one of the two finest buildings in Britain. Behind the cast iron at first floor are square ashlar pilasters with a simple anthemioned capital carrying an entablature with a disc pattern below a running anthemion pattern. The windows are set within in timber frames with filleted corners where there is an incised pattern in the spandrel. This visually seems to be an attempt to visually tie the first and second floors together where the frames on this floor echo the form of the capitals above. 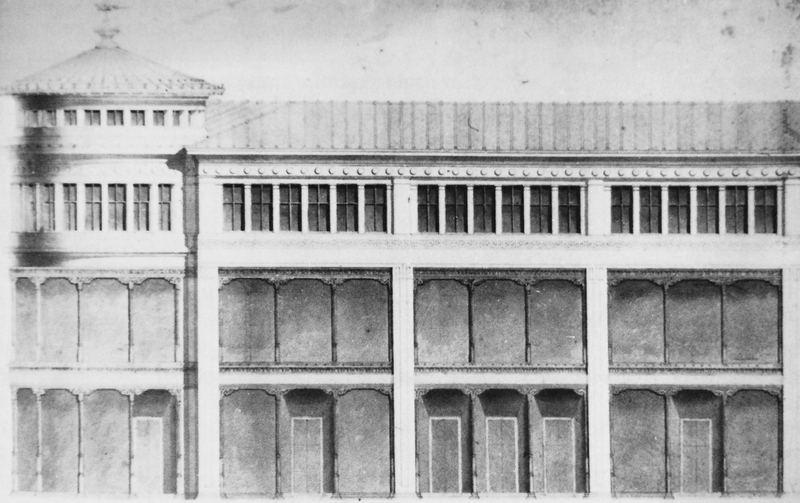 At second floor level, the masonry structure is recessed back and stripped of any detail, the window frames are simplified down to rectangular and the cornice too is devoid of any decoration, one would assume to focus attention on the column capitals and to prevent the overall composition becoming too busy. At third floor level the effect of the balcony has been lessened by the introduction of an intrusive flashing making it appear heavy. The original balcony above is a running anthemion pattern in cast iron with upstands along the top of the balustrade. Behind is a masonry pilastrade of square columns that are intricately decorated key pattern, disc pattern and anthemions that wrap around the corners as the columns taper towards the capital which is decorated with a running anthemion pattern. Above is an entablature with a running pattern of flowers and a simple cornice above. The composition is completed by a balustrade composed of squared balusters with anthemioned dies dividing panels of decorative cast iron, again with a continuous anthemion pattern, hiding a series of gabled dormers from the mansard roof. On the centre line of the buildings curve is a pedastal, upon which is a statue of a buck ‘couchant’ (translation: (of an animal) lying with the body resting on the legs and the head raised. New word for today in the bag!) Yet another great piece of work by John Mossman who just seems to pop up everywhere! On the 1864 Thomson eschews the use of cast iron on the facade and instead replaces this with a giant order square pilastrade carrying an entablature with an incised key pattern. The fenestration pattern at first and second floor remains almost the same, with the second floor windows increased slightly in height. 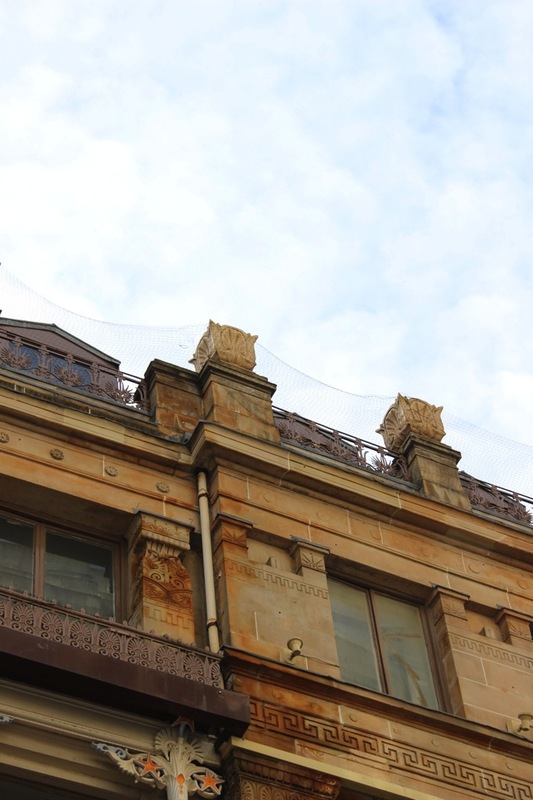 Above Thomson omits the elaborate columns that formed the eaves gallery and narrows the windows. Thomson also splits the pilasters into dwarf pilasters in the upper quarter, below these have a simple incised pattern, above the dwarf pilasters bear a sun design,whilst in the recess creates between the two there is an enlarged version of the upstand (I’m sure there is a proper name for these chaps!) from the top of the third floor balustrade. The only alteration Thomson makes above this is to simplify the flowers on the entablature to a disc pattern. Structurally and decoratively this building is a rather unique experiment in the use of cast iron; the ground floor is borne on large cast iron columns, above this then splits into the external decorated columns, the masonry skin and then a secondary cast iron structure behind which was bedded into the masonry and also supported the internal floors. The structure is tied together by a cast iron ring beam that seemingly ties together the external and internal cast iron structure. 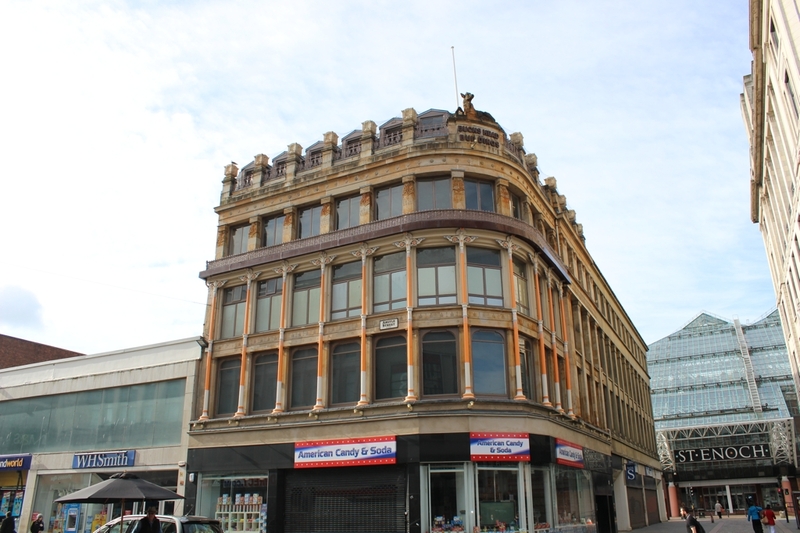 It is certainly plausible that John Baird’s earlier, Gardner’s Warehouse on Jamaica Street, would have had an influence on Thomson who was trained by Baird. Both Baird’s building and Buck’s Head also utilise the same McConnel’s patent cast iron structure. 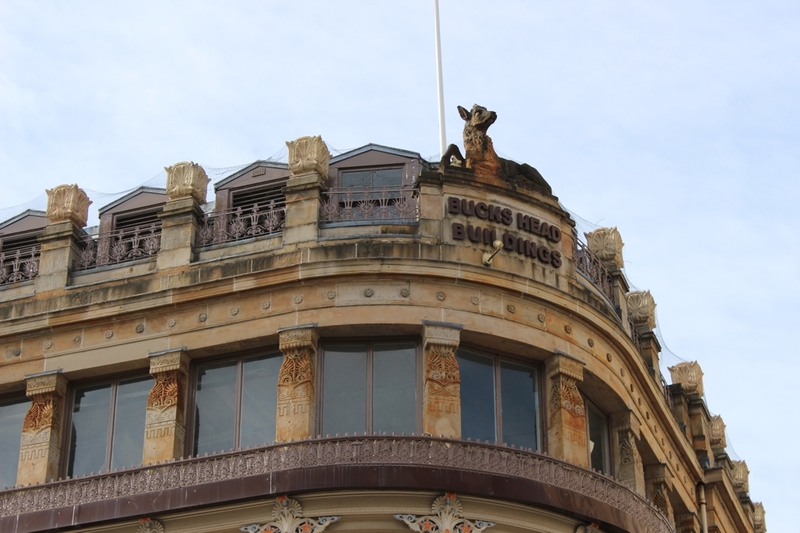 The Buck’s Head is a hugely significant, although enigmatic, building that is an intriguing step in Thomson’s ever developing architectural theory. The archive image above is really rather interesting in that it shows that despite being carried out within a year of one another and sharing a number of identical architectural features the characters of the two buildings are quite different, but both have their merits. The first appears much lighter in structure and is more highly decorated, however that also causes it to lack the strong horizontality and rhythm that the latter element has and that we so commonly associate with Thomson. We can speculate on what Thomson’s reasoning might have been for this shift – perhaps ongoing issues with the city architect, a less prominent street, less budget and so on – it could have been all of these or none. 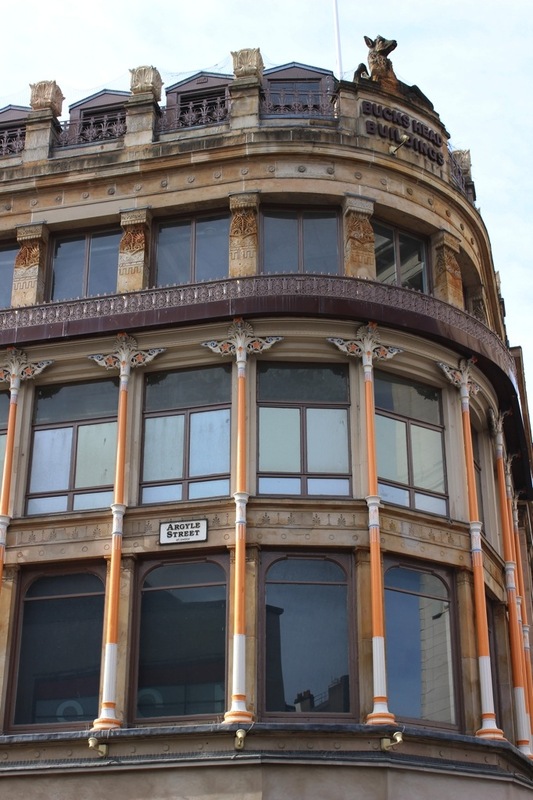 The question over why Thomson never returned to utilising cast iron as a major facade component again, despite using it to spectacular effect in a number of his interiors, persists and suggests that there was an underlying reason for this. Personally, visually my preference is for the Dunlop Street building with its clearly trabeated construction, symmtery and strong lines, however the Argyle Street building more clearly emphasises Thomson’s architectural mind in full flow bringing together elements of Greek, Egyptian and Assyrian architecture into the facade design, developing a complex and innovative structural system and utilising this to create a building full of delight. I do feel like had the building been larger or not on a corner its effect could have been greater, it has that feature of so many of Thomson’s urban buildings where you could just imagine it continuing on down the street endlessly. In summary, this building is brilliant, and the fact that the city council continue to let people desecrate it with horrific shop signs really is an embarrassment! It is an important step in the development of Thomson’s warehouse architecture, and as well as being an excellent building itself it also contains elements we later see in his masterpiece in this particular genre, Egyptian Halls (most notably the cast iron capitals here are similar to the first floor stone capitals at Egyptian Halls). Not only that, this is also another one that is far too conveniently located for anyone to have an excuse not to stop and appreciate it for a minute, so go enjoy it! You can find the Historic Environment Scotland listing for this building here. Interesting! I had never noticed the Buck’s Head till, I think, last year when I was wandering around looking for images for my A to Z of Glasgow. It didn’t make the cut for B but it might well appear at some point. I recently bought a book called Look Up Glasgow and an A to Z of things you spot on rooftops is an appealing idea.